Nearly 10,000 walked and raised more than $1 million for United Way of Greater Los Angeles' 11th annual HomeWalk. Today, United Way of Greater Los Angeles hosted its 11th Annual HomeWalk – the only 5K family run/walk dedicated to raising public awareness and funds to end homelessness in L.A. County – in Downtown Los Angeles’ Grand Park. The event kicked off with special appearances by Elise Buik (United Way of Greater Los Angeles, President and CEO), Mayor Eric Garcetti, Supervisor Mark Ridley-Thomas, Eric Dickerson (Los Angeles Rams Hall of Famer), Jon Huertas (star on NBC’s This Is Us), Seamus Dever (star on ABC’s Castle), as well as other elected and city leaders. Presenting Sponsor representative Peter Laugharn of the Conrad N. Hilton Foundation and VIP Sponsor representatives Kelli Bernard of AECOM and Cinny Kennard of the Annenberg Foundation were also among the 10,000 participants who raised funds and walked to end homelessness. This year’s top individual fundraiser was Lisa Alexander from SoCalGas, and the top team fundraiser was SoCalGas with more than $108,000 in contributions. Over the past ten years, HomeWalk has raised over $7.6 million, which directly helped to bring 18,000 of our homeless neighbors home for good. This year’s HomeWalk raised more than $1 million, thanks in part to the Conrad N. Hilton Foundation Challenge – which matched every $5,000 a person or team raised with another $5,000. This year’s HomeWalk came on the heels of the passage of Prop HHH and Measure H, which will bring $4.7 billion for building supportive housing and homeless services in Los Angeles County over the next ten years. During the event, United Way also announced its Yes to Housing initiative. Yes to Housing is a countywide campaign that will partner with community leaders to build momentum for proposed supportive housing, which is critical to ending chronic homelessness. There are currently more than 57,000 individuals, families, and veterans suffering from homelessness in Los Angeles County – of which only 27% live in Metro Los Angeles. The 11th annual HomeWalk wouldn’t be possible without support from its sponsors – allowing 100% of funds raised from participants to go directly back into the community. This year’s sponsors include recurring Presenting Sponsor: the Conrad N. Hilton Foundation, VIP Sponsors, AECOM and the Annenberg Foundation, as well as Major Sponsors including AEG, Dignity Health, JPMorgan Chase, SoCalGas, and Torrance Refining Company. For more information about how to join the fight to end homelessness, visit unitedwayla.org. You can also follow United Way of Greater Los Angeles on Facebook, Instagram, and Twitter via @LAUnitedWay. Hi-res images from this year’s HomeWalk are available for download here. United Way of Greater Los Angeles is a nonprofit organization fighting to end homelessness and poverty by providing students with support needed to graduate high school prepared for college and the workforce, providing housing for our homeless neighbors, and helping hard-working families become financially stable. United Way identifies the root causes of poverty and works strategically to solve them by building alliances across all sectors, funding targeted programs and advocating for change. For more information, visit http://www.unitedwayla.org. 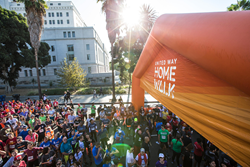 HomeWalk is United Way of Greater Los Angeles' annual 5K family run/walk to end homelessness in L.A. County. United Way of Greater Los Angeles is leading the fight to end homelessness and poverty in L.A. County.